For those of you who have been holding out for one of our more traditional style shows, your wait is over! 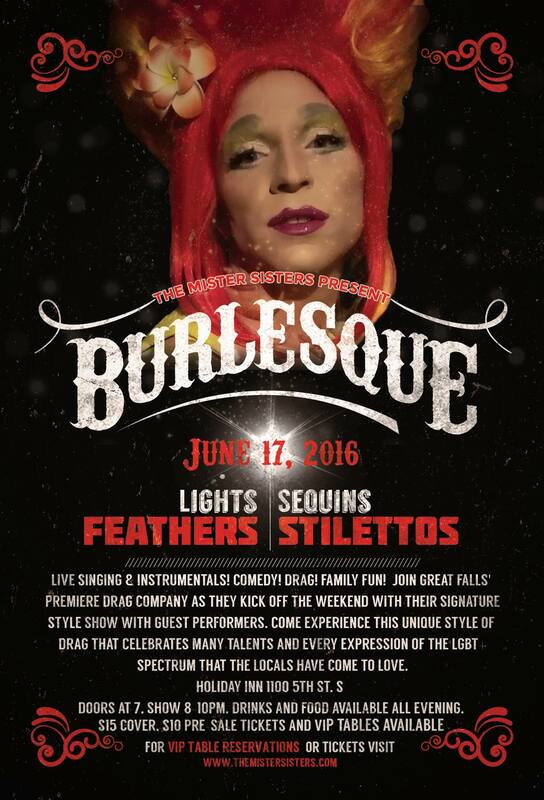 Come join us June 17th and kick off Pride weekend with the Mister Sisters! After sustaining a head injury after carelessly tripping on discarded New Amsterdam bottles, Kola awoke covered in sequins, feathers, a little broken glass and also with the delusion that she and her fellow drag sisters had become part of a word famous Burlesque group about to perform one of their biggest shows ever in which she is the main attraction. Ever the loving sisters, the other Misters have gathered their friends to help enact this mistaken identity out under the advice of Kola’s doctor. How long can the other Mister Sisters keep up this ruse in hope that their injured sister’s memory will return before her diva demands hit an all time high and they take measures into their own hands? Join us for a fun night of lip synching and live performances that you have come to love from the Mister Sisters and friends! General Seating is $10 in advance $15 at the door. Four VIP tables are available which can each seat you and nine friends and come with extras from the Mister Sisters in addition to having the closest seat in the house to the action! Get your limited VIP table before they sell out – $300 ea. A portion of this show’s proceeds will go to directly benefit local LGBT organizations and charities.